After holding meetings under the Town Hall (in a room described as "small and wretchedly inconvenient) beginning in the summer of 1858, a church was formed in 1860, and then a site for a chapel was bought for �5, at the expence of Thomas Barnes of the Quinta, a patron of Congregational churches. The chapel, situated on the main road through Church Stretton, was designed (gratuitously) in the gothic style by Joseph Bratton of Birkenhead. Tenders from builders were invited in early May 1865 and the chapel was built by Mr Richards of Pulley Common in 1865-6 at a cost of about �00. The foundation stone was laid on 29th August 1865 by Thomas Barnes and had a bottle containing coins and newspapers placed underneath it. The chapel was opened on the 29th May 1866. It has a stone facade, but brick sides, now rendered. The chapel was renovated in 1886. 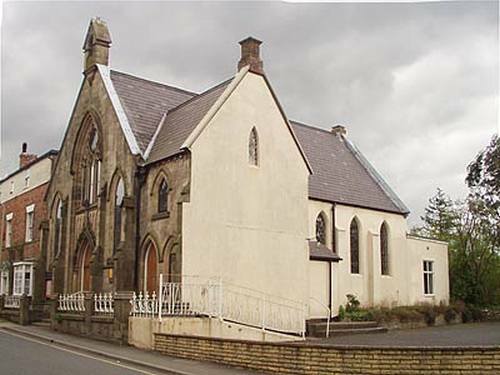 It is in good condition (and was renovated in 2006) and still in use in 2018, and now belongs to the United Reformed Church.